It being the holidays it seems like a great time to not just look forward to the fun things we want, but also at those we have that really stood out for us. What was, or still is, your favorite RPG book of all time? It doesn't have to be a system, it can be a supplement or even a linked product, but it has to be RPG related. For me it's Hero High for Mutants and Mastermind's Second Edition. Hero High has tips and advice for running a Teen super hero game, but it goes a lot further than that too. 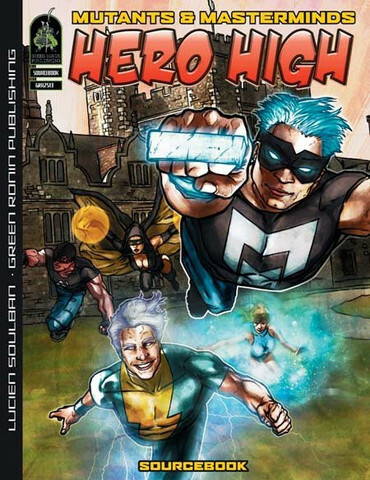 The whole book is written in the tone of a teen super hero book with fun art and great ideas. The game breaks down the types of stories you get with teen heroes, why they work, and why we can't get enough of them. This book, a simple supplement, is responsible for two of the best games i've ever ran - both teen super hero games - and has influenced a lot of what I do in other RPGs, especially when dealing with common teen themes like coming of age, and passing the torch. Flat out, I love this book, and I still consult it from time to time - though I currently am not 100% sure where it is with the recent move and that makes me sad. It's a great book, and useful if you're interested in stories about Teen Heroes, regardless of the actual system you're using.